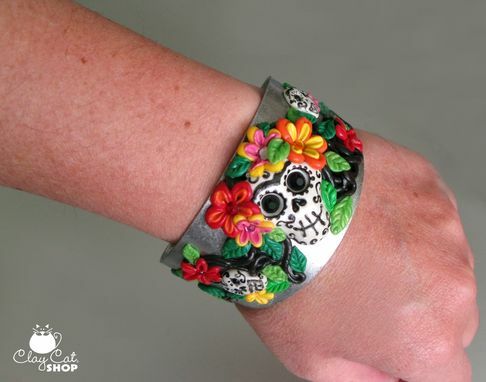 This bright and colorful "Day of the Dead" cuff bracelet is inspired by the Mexican holiday, Día de los Muertos, which celebrates and honors the departed souls of the deceased. 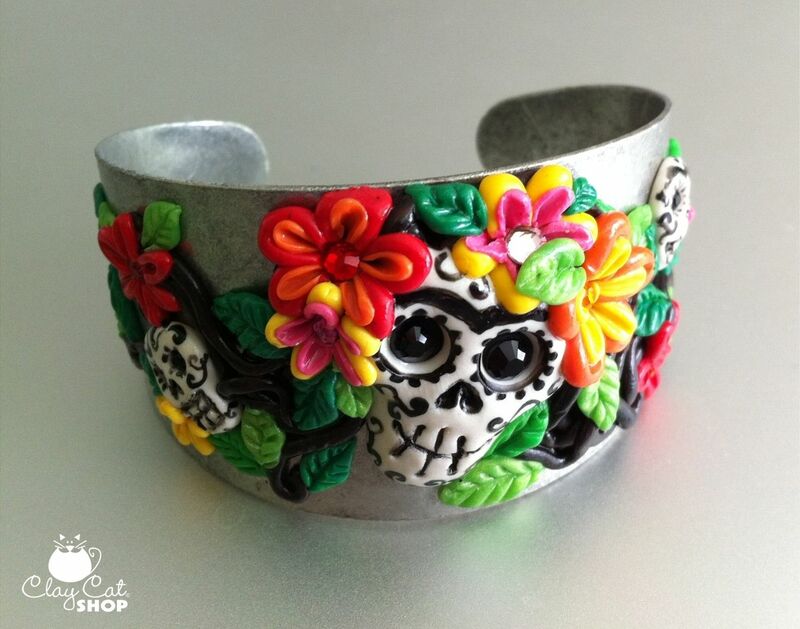 It features charismatic skulls and bright garden flowers. Colorful Swarovski crystals add just the right amount of sparkle. This is a fascinating bracelet that can be worn year round. It also makes a great conversation piece. This is a limited edition bracelet. Order now. "The only thing I know is that I paint because I need to, and I paint whatever passes through my head without any other consideration". ****About our pieces: All our pieces are delicately hand sculpted out of professional polymer clay then decorated with acrylics and original Swarovski crystals. Our cuffs are professional quality, plated, tarnish free (Made In the USA) Pewter products. Lead Free. The clay is attached with a special glue and so far none of my pieces have come loose. Of course, this is a wearable art piece, needs to be handled with love and care. MADE TO ORDER: Please allow 2 to 3 weeks for design and completion of your unique piece. This is an original polymer clay sculpture by Adriana Ayala, ClayCatShop's artist and it is protected under trademark laws. It may not be reproduced in any manner without the artist's written permission.